POP FROM ALL ANGLES: Cold Cave -- Please Come to Texas? I guess I’m being greedy by begging Cold Cave to ditch their European tour and head on down Austin way. 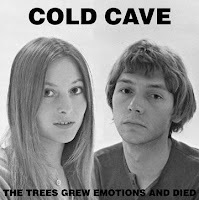 Even though I’m seeing about 500 bands I’ve been wanting to see for some months, and even though lately there’s been an unhealthy influx of new singles to pick and choose from, I can’t seem to put Cold Cave’s recently repressed EP, The Trees Grew Emotions and Died, back in its sleeve. Like tonight, I’m getting a head start on the best week of the year by seeing the Blank Dogs destroy the Summit – Cold Cave seem to spelunk in similar domains, only with brighter synth-waves and more succinct melodies, still remaining as damaged and drowsy as the BDs. This isn’t any kind of competition whatsoever, I’m just currently preferring the Cold Cave dreary new romanticism. For fans of the Associates, OMD, TSOL, and Ultravox. Lucid. Please come to Texas, or at least Ohio once you get back.